We discovered this advertisement for a James motorcycle, not in a magazine but in the portfolio of a professional illustrator named Arthur Walker. All the examples glued into the portfolio date from the 1920s – so we tried to identify the model of James shown here, and found it right in the middle of that decade: a 1925 (or thereabouts) James Model 12 500cc 4-stroke V-twin. The James Cycle Co Ltd., Greet, Birmingham, England, was one of many British cycle and motorcycle makers centred in the Midlands. Their light motorcycles, often with a characteristic maroon finish, used 2- and 4-stroke engines of their own manufacture and, later, from Villiers and AMC. 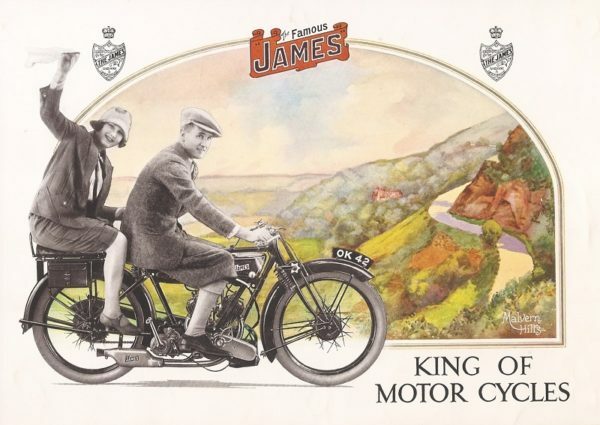 James were prolific bicycle and motorcycle manufacturers from 1897 to 1966. The company was taken over by Associated Motor Cycles in 1951 and combined with Francis-Barnett in 1957. The illustrator Arthur Walker clearly had a contract with James for much of its advertising material, because his portfolio includes other colour publicity for motorcycles and children’s bicycles, including a charming 16-page “Brownie Booklet” from 1925 entitled “Jimmy & Joan in Cycleland” with various prize competitions offering bicycles for the children and, for grown-ups, a “James 2½ h.p. Motor Bicycle, value £44” as first prize. “Jimmy” was not just used to promote children’s bicycles; the nickname for the Model 12 in our pictures was a “Jimmy”.